Every season is wedding season here at PartyCheap! We want to help you create the most beautiful night of your life without breaking your budget. We offer a wide variety of inexpensive wedding party decorations - transform any venue into a warm and welcoming environment for all your guests. Our elegant wedding supplies are timeless, featuring classic wedding party supplies like White Doves and Church Bell Centerpieces. Regardless of your wedding theme we have exactly what you’re looking for! Don't let the party stop after you've tied the knot - decorate for your wedding reception too! Our wedding reception decorations will make the night unforgettable! At the end of the night, send your guests home with a little memory of your special day. Wedding party favors, such as Wedding Bubbles, are sure to be a hit. Let us serve you on your special day! And don't forget to come back and visit PartyCheap every year for your anniversaries! Weddings are one of the biggest and most special days in your life. And, yes, much to your parents disappointment, you want an elaborate wedding with beautiful white tissue bells hanging from the ceiling of your reception hall and table settings that will awe your wedding guests. But decorating for a wedding doesn't have to be expensive (as your parents breathe a sigh of relief)! Check out our huge selection of wedding party supplies! 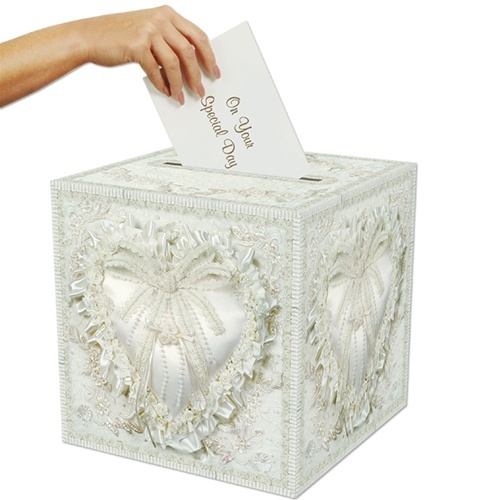 We offer many wedding accessories like our tissue decorations which are very popular with wedding planners as they are reminiscent of the past and very economical for the amount of space they fill up. String up some Westminster Wedding Bells throughout the reception hall and stream up some tissue garland between each bell to complete the look. Whether your big day is just around the corner or you’re just beginning to think of wedding themes, we have the supplies and decorations that are just right for you! One thing you won’t want to forget are the tissue doves, which are always important to have at weddings as they symbolize love and peace. And what’s the best part of having a wedding reception? The wedding reception decorations, of course! Decorate the gift table with this large Celebration Arch and sprinkle of Wedding Day Confetti around a beautiful wedding card box. With these decorations in place, all of your guests will know where to place their gifts for the happy couple. Fill the reception hall with numerous wedding props that will make your big day shine. The wedding reception decorations will leave a lasting image on your guests! Make your special day one you will never forget while not breaking the bank by partying with us at PartyCheap.com! Some of our most popular wedding centerpieces is the White Wedding Bell Centerpiece. When the bride and groom wave their goodbyes as they head off into the sunset, make sure they leave in style with their wedding car covered in our extensive selection of wedding decorations! And down the road, don’t forget the wonderful bride and groom on their anniversary! PartyCheap offers a huge selection of anniversary decorations and can give you some great ideas for anniversary party ideas!